Cocaine is a highly popular stimulant drug that gives its users a high amount of energy and pleasure. It is also highly addictive, and its users can develop a physical dependency. Cocaine originates from the coca leaves of South America, where indigenous people would chew the leaves for energy. In modern times, cocaine is distilled to its pure form and powdered, which is how it is consumed by users and is a powerful stimulant drug. The physical warning signs of cocaine abuse can vary depending on the person. Quite often the eyes are a good indicator of cocaine use; a user’s eyes may appear wide, bloodshot, or have dilated pupils. Stimulants like cocaine increase heart rate and blood pressure so heart irregularities can be a warning sign. Cocaine users often have an elevated speech pattern and speech irregularities. Because cocaine is an appetite suppressant, people who use cocaine regularly often lose weight or have a decreased appetite. And because cocaine is powerful stimulant, people who use cocaine often have a difficult time falling asleep or suffer from disruptive, inconsistent sleep patterns. Nausea, shasking, and other physical illness due to withdrawal. If you notice these signs in a person you love, then it should cause for concern. While a few of these signs may not necessarily point towards addiction, it can be indicators that should raise serious questions. Getting a loved one detoxed and into rehab for cocaine should be of the utmost importance for their loved ones. 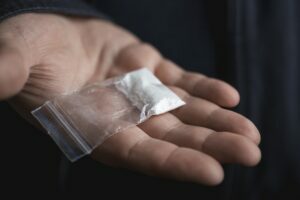 Cocaine is a highly addictive substance, and it can be difficult, and even quite dangerous, to try to kick a cocaine habit if you have engaged in a prolong period of chronic abuse. In these cases, a person’s body and mind have adapted to be dependent on cocaine, which means that the safe course of action is to first go through a detoxification process, and then to check into an effective rehab program. If you or someone you know struggles from cocaine abuse, then please don’t hesitate to give a call to the caring staff at ReAlign Detox. We can help you heal from the initial withdrawals of cocaine, and have partnerships with highly regarded rehabilitation facilities that can put you on a path towards lasting recovery.